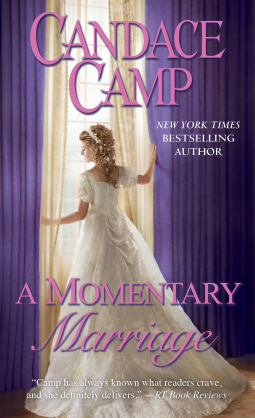 New York Times bestselling author Candace Camp offers a delicious marriage-of-convenience story in this passionate historical romance, featuring her signature “clever and witty banter, sharp attention to detail, and utterly likable characters” (Publishers Weekly, starred review). James de Vere has always insisted on being perfectly pragmatic and rational in all things. It seemed the only way to deal with his overdramatic, greedy family. When he falls ill and no doctor in London can diagnose him, he returns home to Grace Hill in search of a physician who can—or to set his affairs in order. Arriving at the doctor’s home, he’s surprised to encounter the doctor's daughter Laura, a young woman he last saw when he was warning her off an attachment with his cousin Graeme. Alas, the doctor is recently deceased and Laura is closing up the estate, which must be sold off, leaving her penniless. At this, James has an inspiration: why not marry the damsel in distress? If his last hope for a cure is gone, at least he’ll have some companionship in his final days, and she’ll inherit his fortune instead of his grasping relatives, leaving her a wealthy widow with plenty of prospects. Laura is far from swept off her feet, but she’s as pragmatic as James, so she accepts his unusual proposal. But as the two of them brave the onslaught of shocked and suspicious family members, they find themselves growing closer. They vowed, “until death do us part”...but now both are longing for their marriage to be more than momentary in this evocative romance, perfect for fans of Sabrina Jeffries and Mary Balogh.